Banana Bread has stood the test of time. You can tell a favorite recipe by how often it is used, and this recipe is one I return to again and again. In fact, I often buy bananas expressly for making this bread, impatiently waiting for their skins to turn brown and their flesh to become soft and sweet. 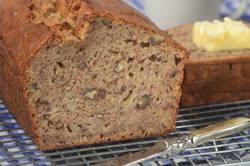 Banana bread starts with a thick sweet batter that is full of mashed bananas, ground cinnamon and chopped nuts. It is, as the name "Quick" Bread implies, quick to make. The dry ingredients are mixed together in one bowl, the wet ingredients are mixed together in another bowl. The two are combined and you are done. When you pull this banana bread from the oven the golden brown crust is delightfully crisp and although the crust softens once the bread is covered and stored, its wonderful moist texture and sweet flavor remain intact. There are many types of bananas, but for this recipe we're using the long and curved bright yellow variety sold in bunches. Arriving at our shores over a hundred years ago, this tropical dessert fruit has many virtues; it is available year round, reasonably priced, of consistent quality, easy to peel, and most importantly, we know by the color of its skin how firm its flesh will be and how sweet it will taste. When you think about it, not many fruits can tell us so much just by looking at them. Bananas are picked while still green which means its flesh will be hard with little flavor. As time passes and the banana ripens its skin begins to turn yellow and with that its flesh softens and its flavor sweetens. Further aging causes the skin to brown and its flesh to become very soft and sweet. At this stage some people throw these bananas in the garbage thinking they have gone bad, not realizing how delicious they will be when mashed and baked in a bread or cake. If you are like me almost every time I buy bananas a few (not enough though to make this Banana Bread) will turn brown before I get around to eating them. Instead of throwing them away, simply place them into a plastic bag and freeze until you have enough for baking. You can also peel and mash them, stir in 1 teaspoon lemon juice for each banana, and freeze in an airtight container or bag. They will keep about six months in the freezer. Banana Bread Recipe: Preheat oven to 350 degrees F (180 degrees C) and place oven rack to middle position. Butter (or spray with a non stick vegetable spray) the bottom and sides of a 9 x 5 x 3 inch (23 x 13 x 8 cm) loaf pan. Line the bottom of the pan with a piece of parchment paper.